Today, I went and spoke to the bank about a home loan after working out it would only cost us a couple of hundred of extra dollars a month to be paying off our mortgage instead of paying rent. 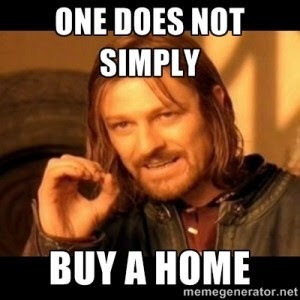 And I found out we are a lot further away from buying a house than I thought. Now I don’t know about you, but I’d heard a lot of rumours about getting a home loan that kind of had me thinking I’d be walking out of there with a fat debt and and an opportunity to make a house our forever home. Yup, so that didn’t happen! Here’s the deal- most banks will loan you up to 95% of the house price, which is pretty generous if you ask me. So I was under the impression that for a house of $500,000 we’d need to have a cool $25,000 in the bank. Yup, it’s a hunk of cash but doable. Once you have your deposit, you also have to have your stamp duty. If you’re a first home buyer like us, you’ll get 40% of that deposit back. But here’s the thing, you actually have to have 100% of the amount and then our generous ol’ government will refund you the deposit. Yup. Okay, ‘sometimes’ they accept just the 60% BUT in the 3 years my broker has been in the business she’s only seen that happen once. So now this 5% deposit is up to $51,557- with a refund of approximately 10k coming your way. Starting to seem a bit further away for you? Us too. When borrowing over 20% of the purchase price, you need to purchase a little thing called lenders mortgage insurance(LMI). I’d heard of it, but I didn’t fully grasp it. On the day of settlement, you need to have 100% of your LMI. You cannot include that amount in your home loan, you have to have cash on the day. And for a loan of $500,000 that’s a cool $16,234.62 extra. $25,000 seems so minimal now compared to the odd $68,000 actually required to get into the housing market. Alas, we’ll keep chipping away and one day (in the not to distant future I hope) we’ll make our Australian dream come true! How did you ‘chip’ your way into the housing market? *please note I’m not an expert! We’re just young family trying to do as much research before we buy our first home- and sharing what we learn along the way. This entry was posted in About us and tagged Australian real estate, banks, family home, first home buyers, home loan, house loan, real estate, the Australian dream. A financial planner would be a good start to assess your situation and goals, followed by a Real Estate mentor to guide you through. Enjoy!